And I found a green one that looked yum and tried it out. Typically if I offer the boys anything that looks even vaguely healthy or has evidence of green vegetables in it they run screaming to the Dairy for a nice comforting steak and cheese pie. 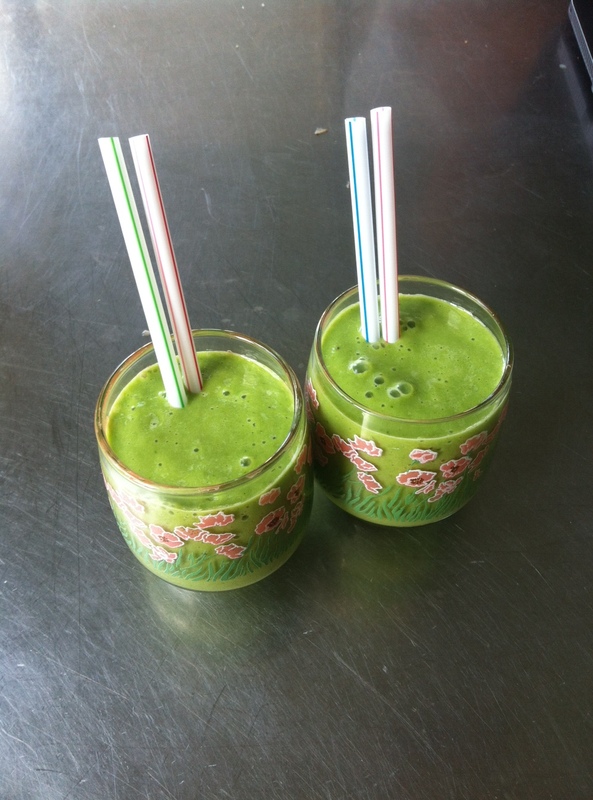 Whack the spinach and kale in the blender with the liquid and whizz until it’s whizzed. Then add the fruit and avocado and whizz it up some more – voila! (in the past I have not whizzed the leafy greens separately from the other bits and it has been bitsy and yuck – this time it was a revelation! not tiny bits of greenery in my teeth afterwards). Then I told the kid it was a ‘Kermit the frog’ and, once I had calmed their fears that there was an actual frog in it – they drank it and Master 7 liked it! success! He said ‘Mum we can drink these in the morning after we go running eh?’ and I went all warm and fuzzy. We got him running shoes today so he is a bit keen on it. That’s all from me – melting in the heat but loving it – withdrawing and aching and nearly died in boot camp this morning – got the shakes HARD. But, like I said, I know why and I know how long it will last roughly so I’m not freaked, just hanging out for it to be over. Another Bootcamp session tomorrow – on the beach so it will be lovely and good for my soul – if not my poor old shaky legs….